Loose-Fitting Slipcovers: Shabby or Chic? For my first apartment, I lugged my parents' old sofa and matching armchairs, circa 1982, out of storage. I needed the free furniture, but it was hard for me to overlook the gray, pink and blue tweedy upholstery (which, for the record, was not as bad as I thought it was at the time). In spite of this I refused to slipcover them, because to me, at the time, slipcovers were sloppy and weird. But lately I've been seeing — and loving — lots of loose-fitting slipcovers that I might not have appreciated in my callow youth. What do you think, shabby or chic? The Larssons' home (you can read all about it here) was above all a family home (they had 8 kids). You can see from this painting that it was important to them that the home be livable and comfortable: instead of a formal portrait of an impeccable sitting room, Larsson includes the dog, the mussed-up rug, the scattered newspaper, the slippers — and the wrinkled, just-sat-on slipcover on the couch. Like most of the textiles in the home (the rag rugs, the curtains, the bedclothes, etc. ), the slipcover was handmade by Karin. Its wrinkled appearance was another sign of a warm, idyllic family life. Some of today's loose slipcovers also suggest a cozy, comfortable home life, while others exploit the sensuousness of drapery. The Italian company Busnelli (image 4) has even made their slipcover non-removable, button-tufting the front and letting the back hang loose, evoking the dress of Classical marble statues. What do you think about loose slipcovers? 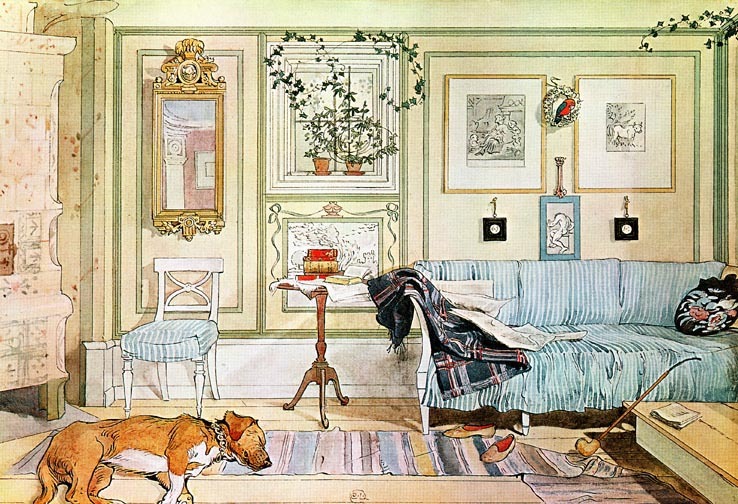 "Lazy Corner," by Carl Larsson, c. 1898, via My Friend's House.